MINAMISOMA, FUKUSHIMA PREF. - The ashes of half a dozen unidentified laborers ended up at a Buddhist temple in this town just north of the crippled Fukushima No. 1 nuclear power plant. Some of the dead men had no papers, others left no emergency contacts. Their names could not be confirmed and no family members were tracked down to claim their remains. 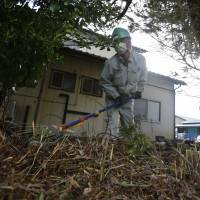 They were simply labeled “decontamination troops” — unknown soldiers in Japan’s massive cleanup campaign to make Fukushima livable again five years after radiation poisoned the fertile countryside. The men were among the 26,000 workers — many in their 50s and 60s from the margins of society with no special skills or close family ties — tasked with removing the contaminated topsoil and stuffing it into tens of thousands of black bags lining the fields and roads. They wipe off roofs, clean out gutters and chop down trees in a seemingly endless routine. Coming from across Japan to do a dirty, risky and undesirable job, the workers make up the very bottom of the nation’s murky, caste-like subcontractor system long criticized for labor violations. Vulnerable to exploitation and shunned by local residents, they typically work on three-to-six-month contracts with little or no benefits, living in makeshift company barracks. And the government is not even making sure that their radiation levels are individually tested. Residents of still partly deserted towns such as Minamisoma, where 8,000 laborers are based, worry that neighborhoods have turned into workers’ ghettos with deteriorating safety. Police data show arrests among laborers since 2011 have climbed steadily from just one to 210 last year, including a dozen yakuza, police official Katsuhiko Ishida told the prefectural assembly. Residents are spooked by rumors that some laborers sport tattoos linked to yakuza, and by reports that a suspect in serial killings arrested in Osaka last year had worked in the area. Most of the men work for small subcontractors that are many layers beneath the few giants at the top of the construction food chain. Major projects such as this one are divided up among contractors, which then subcontract jobs to smaller outfits, some of which have dubious records. The Ministry of Health, Labor and Welfare examined more than 300 companies doing Fukushima decontamination work and found that nearly 70 committed violations in the first half of last year, including underpayment of wages and overtime and failure to do compulsory radiation checks. Those companies were randomly chosen among thousands believed to be working in the area. “Violations are so widespread in this multilayer subcontract system. It’s like a whack-a-mole situation,” said Mitsuaki Karino, a city assemblyman in Iwaki, a Fukushima Prefecture city where his civil group has helped workers with complaints about employers. Karino said workers are sometimes charged for meals or housing they were told would be free, he said, and if they lose jobs or contracts aren’t renewed, some become homeless. “It’s a serious concern, particularly for workers who don’t have families or lost ties with them,” he said. Government officials say they see no other way than to depend on the contracting system to clean up the radiated zone, a project whose ballooning cost is now estimated at ¥5 trillion. “That’s how the construction industry has long operated. In order to accomplish decontamination, we need to rely on the practice,” said Tadashi Mouri, a health and labor ministry official in charge of nuclear workers’ health. He said the ministry has instructed top contractors to improve oversight of subcontractors. Several arrests have been made in recent months over alleged ﻿﻿labor violations.A complaint filed by a worker with labor officials led to the October arrest of a construction company president who had allegedly dispatched workers to Fukushima under misleading circumstances. The investigation found that the worker had been offered pay of ¥17,000 per day, but after middlemen had taken their cut, he only received ¥8,000. In another case, a supervisor and a crane operator were arrested in July for alleged illegal dumping of radiated plant debris in Minamisoma. Most workers keep their mouths shut for fear of losing their jobs. One laborer in a gray jacket and baggy pants, carrying cans of beer on his way home, said he was instructed never to talk to reporters. A 62-year-old seasonal worker, Munenori Kagaya, said he had trouble finding jobs after he and his fellow workers fought for and won unpaid daily “danger” allowance of ¥10,000 for work in the city of Tamura in 2012. Officials keep close tabs on journalists. Minutes after chatting with some workers in Minamisoma, AP journalists received a call from a city official warning them not to talk to decontamination crews. 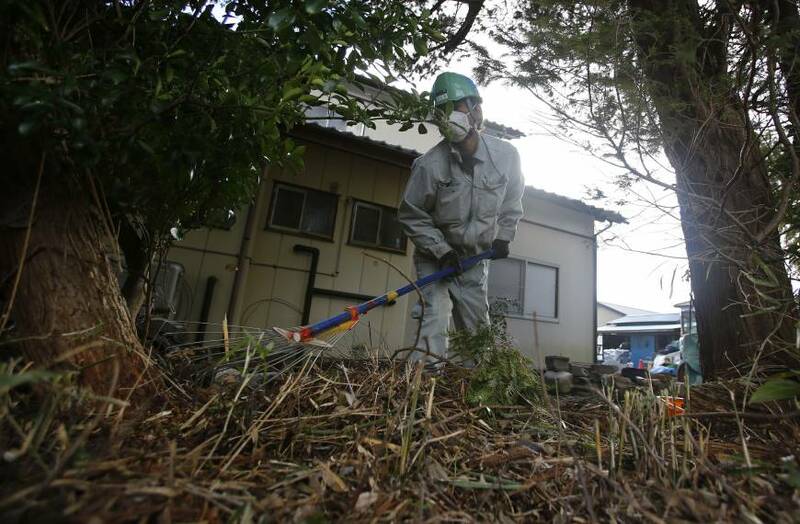 Although most laborers working in residential areas use protective gear properly, others working in remote areas are not monitored closely, according to workers and Nakamura, the leader of the radiation workers support group. The government introduced a system in 2013 but only for a fee, and many lower subcontractor workers are likely not covered. Even non-alarmist experts say that workers’ doses must be kept individually for their own records as well as for studies of low-dose radiation impact. Mouri, the government official, said decontamination workers’ average annual dose fell to 0.7 millisievert last year, a fraction of the 20-millisievert annual limit for those working at the nuclear plant, and is not a concern. Though no radiation-induced illness has been detected, workers have developed diabetes, cerebral and respiratory problems, often long untreated due to lack of money, awareness and social ties, local hospital intern Toyoaki Sawano said in a medical magazine last month. Having trouble making ends meet, a growing number of laborers are seeking welfare assistance, local authorities say. The officials worry they may end up staying on, like construction laborers did in Osaka and Tokyo after the 1960s building boom, forming Japan’s poorest ghettos. Police and volunteers have started neighborhood patrols amid concerns about safety, and some big construction companies have taken steps to address concerns. “The workers face heartless rumors as if they are all reckless outlaws. They are the same human beings. Like anywhere, there are good guys and bad guys,” said Nakamura, the support group leader. One resident grateful for the workers is Hideaki Kinoshita, a Buddhist monk who keeps the unidentified laborers’ ashes at his temple, in wooden boxes and wrapped in white cloth. “We owe a lot to those who clean this town, doing the work that locals don’t even want to,” he said. Tomoyuki Ohwada, an official in the city of Minamisoma, said the worker population should decline next year, when intensive decontamination efforts are scheduled to end. However, Kinoshita believes many will still be needed, given the amount of work left to do.